N. Korea May Stage Nuclear Test After Rocket Launch Concern is growing that North Korea may test a nuclear device after it launches a long-range rocket in upcoming days — a sequence of events that occurred three years ago. Experts say the test could involve highly enriched uranium — rather than plutonium bombs, which North Korea exploded twice before. A concert in Pyongyang in February 2012 commemorates the birthday of North Korea's late leader, Kim Jong Il. 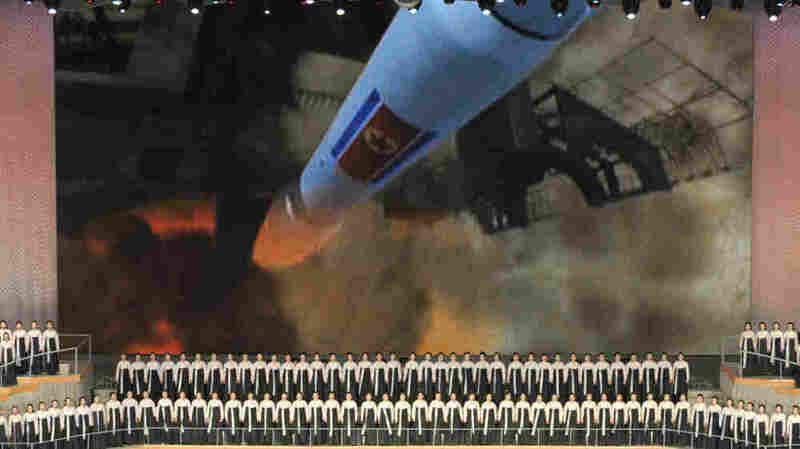 The backdrop shows a North Korean rocket that was launched in April 2009 — and was followed a month later by a nuclear test. As North Korea reaches the final stage of preparations for a long-range rocket launch, concern is growing that it is in the early stages of preparing its underground test site for another nuclear explosion. Pyongyang established the pattern three years ago when it tested a similar rocket and then followed it a month later with a nuclear test. This time around, there may be a more urgent need to test a nuclear device. The bomb is very likely the result of a significant expansion of North Korea's nuclear weapons program. One big difference between the last long-range-rocket test in 2009 and the one this week is that North Korean officials are talking about it and actually answering reporters' questions. A few days ago, they brought international correspondents to the rocket launch site in northwestern North Korea and allowed TV cameras to record images of the rocket on the launchpad as well as a device they said was the weather satellite they want to put into orbit. The director of the launch site, Jang Yong Jin, dismissed suspicions that the rocket launch is really a disguised military missile test. "If it were a ballistic missile, it would have to be hidden in an underground chamber, or it would need to be carried onboard another vehicle for protection. If it were not, then it would be useless in a real war," Jang said. Many North Korea watchers argue that the country's effort to construct an effective three-stage rocket or missile is meant ultimately to reach targets in the United States. Other experts believe the North Koreans are looking at American military bases in Asia and the Pacific. Dan Sneider, of Stanford University's Asia Pacific Research Center, believes this is consistent with North Korean plans to prevent U.S. air and ground forces stationed in Okinawa, Japan, and Guam from defending South Korea. "Their missile program, at least as they conceived of it early on, was intended to neutralize the ability of the United States to intervene from bases in Japan in support of the South Korean army," he says. North Korea does not have an effective air force that could challenge U.S. air power in an actual conflict, so it looks to its missiles to do that job, says Sneider. "So I think it's much more important to them, much more logical for them, to try and put a threat at U.S. forces in the region, not to seriously threaten the United States with an intercontinental ballistic missile," he says. At the same time, activity has been detected at North Korea's underground nuclear test site in the northeast of the country, suggesting that preparations for another nuclear test are under way. North Korea has carried out two nuclear tests in the past, both using plutonium bombs. Neither test was especially successful, experts say. But North Korea stopped producing plutonium several years ago and turned to uranium enrichment, under production at the nuclear complex at Yongbyon, the country's main nuclear facility, located about 60 miles north of Pyongyang, the capital. At the same time, it's likely North Korean engineers have been working to build a warhead that could be carried on a missile like the one currently on the launchpad. Daryl Kimball, the director of the Arms Control Association in Washington, says all these reasons make the case for the North Koreans to carry out another test. "Before they deploy such a weapon, especially on a ballistic missile, I would think that their scientists and engineers and the military would want to proof-test that device. There are simple designs that can be built and one can be quite confident that they will explode without nuclear testing," Kimball says. "But in order to put a smaller device on a ballistic missile, most military planners would want to have a nuclear explosive proof test." In the past, North Korea has warned the West that it would carry out a test if it were chastised by the U.N. Security Council or new sanctions were imposed. Stanford's Sneider says claims like that are smoke screens. "I don't think a third nuclear test would be a response to sanctions imposed. I think that's probably something they've been planning for a long time," he says. It's this pattern of activities, including ongoing production of highly enriched uranium, that most worries Kimball. "One ballistic missile test launch is a problem," he says. "A ballistic missile test launch followed by a nuclear test explosion, followed by uranium enrichment at Yongbyon and facilities probably beyond Yongbyon, is a much more significant problem."